On Friday, October 27, 2017, at approximately 10:18 a.m., officers from the Manchester Township Police Department responded to the area of Buckingham Drive and Thornbury Lane in the Leisure Village West section of town to investigate a motor vehicle accident involving a struck pedestrian. Upon arrival, officers observed a white, 2010 Kia Optima still in the roadway with damage to the windshield and hood areas. The investigation revealed that the Kia was traveling north on Buckingham Drive when the driver failed to observe a pedestrian who was crossing the roadway, causing the collision. 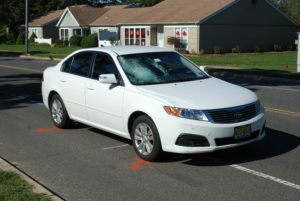 After being struck, the pedestrian was propelled onto the hood and windshield of the vehicle before landing on the sidewalk. 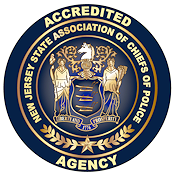 The driver of the Kia, identified as 83 year old Patrice Benjamin of Manchester, was transported via ambulance to Community Medical Center in Toms River for the treatment and evaluation of non-life-threatening injuries. 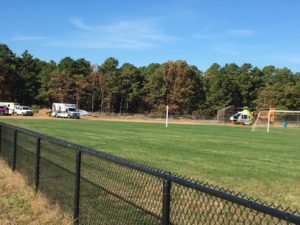 The pedestrian, identified as 76 year old Leroy Lathrop, was transported by medevac helicopter to Jersey Shore University Medical Center for the treatment of serious injuries to his head, back, and extremities. Mr. Lathrop is currently listed in critical condition. Assisting at the scene were members of the Manchester First Aid Squad, Quality Medical Transport, MONOC Paramedics, Ocean County Prosecutors Office, and the Ocean County Sheriff’s Department Crime Scene Investigation Unit. This crash is being investigated by Patrolman Ian Bole of the Manchester Police Department’s Traffic Safety Unit.